You are at:Home»The World of Photography»Does This Make Me Look Fat? To be honest, this cruise ship isn’t fat at all — it’s one of the skinny few that can squeeze through the famous Corinth Canal in Greece. Slicing its way through the Isthmus of Corinth to connect the Gulf of Corinth with the Aegean Sea’s Saronic Gulf, the Corinth Canal is about 4 miles long and just 70 feet wide at its base. With the average cruise ship today coming in at over 100 feet wide at the beam, most ships in operation simply can’t make this passage. 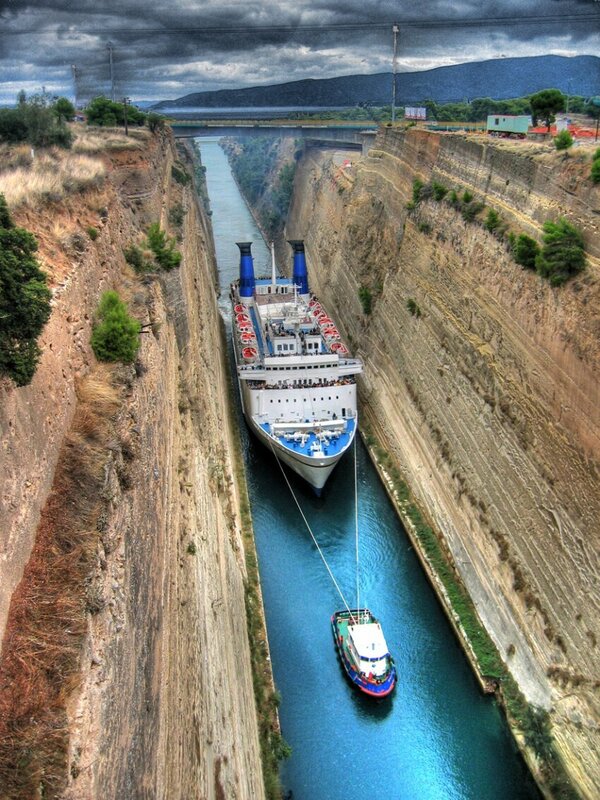 Two thousand years ago, the Corinth Canal was a revolutionary dream. Since the earliest days of sailing ships in the Aegean, it was impossible to travel between the Adriatic and Aegean Seas without traveling around the Peloponnesian peninsula — a detour of about 190 nautical miles. Several ancient world notables attempted to create a shortcut, including Emperor Nero of Rome. Others, including Julius Caesar, considered digging a canal but dropped the idea in fear of displeasing the god Poseidon. Much later, in the early modern era, the Greek governor Capodistrias took on the job — but the expense was too great, and construction stopped. Work was restarted in 1882, and once again proved too expensive. Finally, more funding was provided in 1890, and the canal was officially opened in 1893. Even then, however, the canal turned out to be prohibitively narrow, and the danger of landslides from the cliff walls too dangerous. Sadly, it was never used as those early visionaries had imagined.